We grow thousands of pots every year and sometimes we have some left over from contract grows or just surplus stock. if you buy this pack of 18 half litre pots we will select good quality plants (normally 1 to 3 per species). 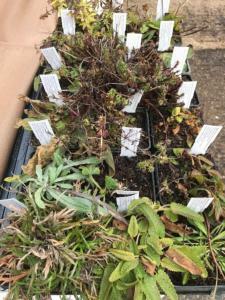 The species available will vary enormously but all our plants are grown here on our nursery from our own seed stocks and you can be assured that we will not include poisonous, invasive or specialist plants in this mix. in fact you may receive a species you had never heard of and start an interesting colony in your garden! A great way of bulking out an existing wildflower area or starting something new at a great low price!